Junior Maddie Wirth, second from left, scored the winning goal in the women's soccer team's State title victory over South Bend St. Joseph. As the cold weather flows in, major sports victories help wrap up the season. 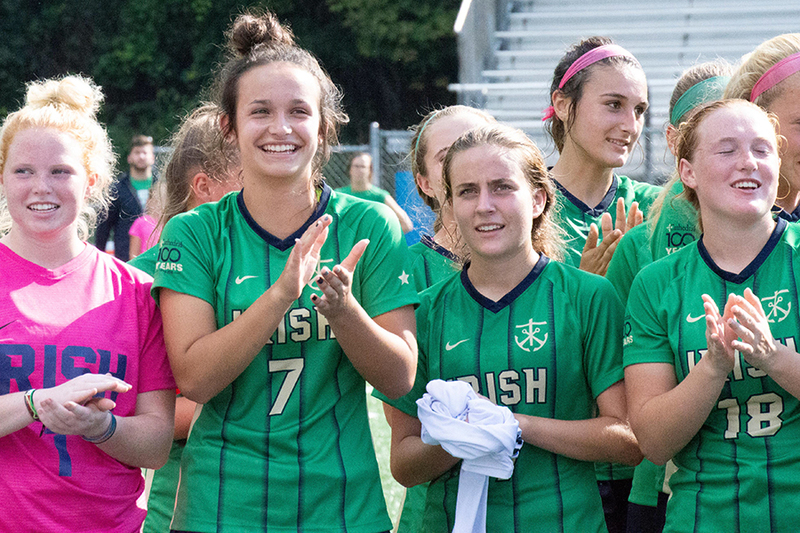 Junior Maddie Wirth, who scored the winning goal in the women’s soccer team’s 1-0 win over South Bend St. Joseph in the Class 2A match, reflects on the team’s accomplishment. Wirth hopes to see repeated success next year. Although the team will lose 13 seniors, the returning players “have a good leadership” and “good team chemistry across the board,” Wirth said. She said she wants to make sure the incoming players are not playing for themselves, but for their team. The team itself shares a close bond, which Wirth attributes to the sheer amount of shared time together. Seniors and juniors drive underclassmen to practice, team dinners are frequent and trips to Indiana University have helped accentuate already existing friendships. Wirth shares her optimistic outlook for herself, too. Working not only but on the field, but also in the classroom, Wirth said precalculus is “definitely her hardest class.” Fundraising for the Tanzania mission trip has also been added to her lost list of school activities. And of course, the upperclassman college search has begun. Wirth said she would like to double major in music entertainment and journalism. Concerning the future of the team, Wirth said, “I feel like I need to step it up.” Wirth said she feels the team now has a target on its back and now next season will be the team to beat. She wants to reflect the success of this year and transfer it.